Slowing down and expanding on the typical emo sound (though never breaking out into screaming fits of fury as is a trademark of emo), The Mercury Program favor jazz influenced drumming and groove-centric bass over a standard rock rhythm section. The slow, tingling guitars and unsettling, off-time nature in which they carry themselves penetrates the music, even during the more rocking times; the outcome is a simmering pot of lightly sprinkled emo-rock amongst slender, soothing sounds of a band coming together and not shooting for any one particular genre. The occasional whispers and talking style vocals add an even more relaxed feeling to the music, where the groove is more important than the hook or the power. 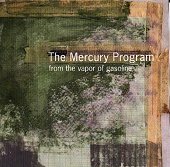 The Mercury program does shed some skin and break out into power chord strikes and heavy, hard-hitting beats; though, even when this occurs, it still feels as if they're holding back punches and trying to contain themselves. They're best when things are slow and steady; when the groove is up front and there to make you notice its present, and everything is out right. Where the band is just playing together and grooving with warming, heart-on-the-sleeve melodies that, even without the presence of words (as is often the case), sticks in your head and makes you feel comfortable with it. At times they seem to drone on and get caught up in their own vivid imaginations. The music is soothing and alive, living beyond the instruments and musicians playing them, but when they drag on with the same beat - only shaking it up with some forced rock action - it loses the initial feeling. Though, quite often they are able to keep you feeling and moving to the groove, a hard task to do, but something that comes natural to them. I'll give From the Vapor of Gasoline a C+.